Really? I have always heard 503 had four braces. Course, I've never had a look myself. 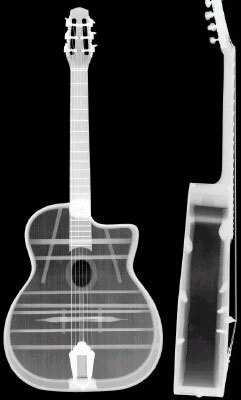 The x-ray picture below can be found in several places on the web, captioned "Django's Guitar" or "Selmer #530", but again, I don't know how authentic this might be. So very sorry, Craig!!! I meant to say 504! I just had another surgery a few weeks ago and was probably medicated (!) and got my numbers backwards. Django's 503 had four braces, but Stochelo's 504 supposedly had five, and did nearly all of the Django Reinhardt models. My point was that four-brace Selmers war an anomaly, and that there doesn't seem to have been a specific run of four-brace guitars that I have been able to find out about. No problem, hope your recovery is going well. I was just worried that what I thought I knew was incorrect. To me there is a very significant difference in the sound of these guitars depending on how they are braced (among other factors) and I'd like to think I can sometimes hear the difference without knowing, at the extremes at least. At the extremes, three brace guitars with thicker tops and no longitudinal bars (Castelluccia and others) sound noticeably different from the H. Selmer five brace design w/ four additional minor longitudinal bars, nine total. Not that one is better than the other of course, both have the sound, but different. Is there any idea why H. Selmer's builders dropped the fifth brace occasionally? If it was only occasional, I wonder what drove it? Where luthiers then having much the same discussion we are having today about bracing? Among themselves, of course, but I picture H. Selmer being somewhat of a factory. Why would they change a design on a whim? Artistic license? Where they having bracing discussions with clients too? Like Django? To some degree, I sure they did. Could it be the four bracers were special requests? Why four on 503 and five on 504? In need to go back and reread F. Charle's book. I got the impression from R F Charles book that the guitars were built in a production line process with a lot of prefabrication and assembly of "components" rather than by "luthiers" working on individual instruments. Who knows, maybe the guy who did the 5th brace was off sick once in a while and no-one thought to stick that brace in there, maybe it fell off because someone forgot to glue it 'cos he was distracted by chat Djangos last gig/visit to the factory - who knows ! I did see one Selmer which seemed to have never had the fingerboard glued on permanently - the only things keeping it attached had been three or four small pins which seemed to have been used a temporary attachement while the neck/fingerboard were being worked on. I suspect the omissions were accidental rather than by design. Oh, I'm sure leaving the fifth brace off was intentional, but the motivation is certainly in question. There was considerable experimentation going on at Henri Selmer Co. through out the life of the guitar division. Less after the war, but even then there were variations like the rosewood necks. I love the discussion on Leo Eimer's site about restoring #430. This guitar had only three braces but not in the common arrangement used by Castelluccia and others. In the case of 430, it looks like they simply omitted the 2nd and 5th braces. Not very successful as the article points out. The more common three brace arrangement is to omit the 3rd and 5th braces. The bridge sits about 35mm up from the what would be the 4th brace in a Selmer design, but now becomes the 3rd brace. The tops are thicker on these 3 brace designs, so it works, but the bridge sitting on an unbraced portion top is part of the magic. Many of these three brace designs had problems with the tops caving at the end of the fingerboards, but that is due to the 1st brace being too light and the light unbraced arched backs straightening out under neck rotation. Not related to the braces in the bridge area and below. There was considerable experimentation going on at Henri Selmer Co. through out the life of the guitar division. Less after the war, but even then there were variations like the rosewood necks. There doesn't seem to be much talk about the post-war batch of mahogany bodied guitars with longer scale and different positions of the soundhole, the bridge and the braces. I was fortunate to be able to borrow one (No. 645) for a recording and was totally floored by its great sound. There is a video and some information in this thread. Since then I found out that Christophe Lartilleux's Selmer is also from this batch. A few month ago, I was even more fortunate when I was at the place the guitar was for sale at that time and another customer came in with a 1947 Selmer! We had a jam swapping the two guitars and the 1947 sounded more like I would expect a great new Selmer copy to sound, whereas the oddball Selmer sounded quite different from the 1947 and confirmed my belief that it indeed sounds unlike any guitar I have ever played, so I am very curious: Does anybody have more experience with these guitars? Frank, that guitar sounds amazing! It has that tonal clarity that Busatos have. Great playing as well! I would love to have a chance to play one of those! Rodrigo Shopis told me once that for optimal tone, the bridge should be a close to the center of the lower bouts as possible. With the longer scale, it looks like the bridge placement isn't far off from Selmer 103. On a normal 12-fret, the bridge is pulled farther forward, which is perhaps why they sound harsher to my ear. Maybe Bob or Craig could enlighten us. Seriously though, I've encountered Selmer petit bouches with three different hole placements and with six scales ranging from 640 to just over 674, though its not entirely clear whether they were all original fretboards or not. In fact, I'm fairly certain some weren't. Selmer used a zero fret and a decent amount of space behind it and they inset the 14th fret a few millimeters in from the edge of the guitar on some guitars... and put the zero fret directly on the edge of the body on other guitars. There are some general rules, but the thing is, these guitars are old, and most have been repaired. If a guy peeled a fretboard off a guitar where its 14th fret was inset, and then measured the distance to the center of the mustaches from the body edge and calculated the scale length and compensation, he'd reach the conclusion that the scale length was longer than it was. If the original fretboard was on the edge and he inset the replaced fretboard, he would consequently shorten the scale. Another oddity.. and the likelihood of this is probably low... is that if a guy measured the first few frets or all 21 frets and extrapolated the scale length from either of those instead of working off the full scale or the zero-to-12, he might occasionally reach an erroneous result because Selmer (and a few other Mirecourt era builders) seemed to have experimented with alternate fret-spacings which I can only guess was an attempt to better intonate the guitar. Notably, I've seen two Selmers whose first few fret-spacings were lengthened and last few were compressed and I'm fairly certain their fretboards were original. So, was it simply an inaccurate fret template? Perhaps - but I doubt it. Those guys were too good to make that kind of mistake. More likely an experiment. I suppose if you intended to play the guitar with high action and no relief, this might be helpful depending on the bridge intonation and method of tuning the guitar, but I suspect that modern players would want better playability up the neck and you really don't need "macho" action to get tone if the guitar is built right, so. Anyway, it seems they tried some hole placement things, some scale and fret placement things, some bracing things, some neck and back and headstock things, some tail and tailpiec things... As all those guys have passed on, we'll never know for sure how much of that was intentional experimentation or custom work or whatever. Under it all though, Selmers sounded like Selmers. They evolved along a similar path to the guitars of Daniel Friederich - getting more concentrated in their sound over time, but I've played some early ones and late ones and middle ones, and they shared some unmistakable similarities though they were somewhat different instruments. It would be wonderful to see both yours and Christophe's side by side. Wow. I can't believe you jammed on Stochelo's old Selmer with Christophe.L. That must have been a hell of a day !! The recordings you did on 645 were great. I've listened to them several times over the years.